The jungle environment is unforgiving for the infantry. I'm just educating myself in the art of getting into contact without getting killed. I edited a short video, hoping that you would find it useful and if not at least to treat yourself to the sights of the jungles of Tanoa. I love ARMA. We need some Vietnam vets to give us tips on how to survive in that environment. There are standard ArmA things that will still hurt the 'realness' of Tanoa. You can run through the jungle at full speed whereas the reality is very different. The AI will still see you with their x-ray vision. But the terrain is just so damn beautiful and the environment sounds are great (especially rain on the jungle canopy). If your recon is dealing with pickets, then you're doing it wrong. Better to set up a diversion, the move slowly into your mission area. Even better is to have backup forces available. Vietnam fighting in part consisted of getting the insurgents/Viet Cong/NVA to show themselves, and then setting artillery and airstrikes on them. I knew a fella who served in Vietnam who told me about being ordered to sit atop M-113s and being sent through the jungle in an effort to determine whether the enemy was there as a means of recon. In planning missions, you should always act like you're the enemy: what would you do and what you expect your forces to do/react to in the event of a sneaky enemy? It make missions you design incredibly difficult, but extremely fun and immersive. Lastly, use VcomAI mod. It makes your enemy a mama bear to deal with. The AI becomes much more efficient and sneakier in combat. The same applies to your own squad. I'm a veteran and went through the USMC Jungle Warfare school in Okinawa (JWTC). I wasn't in Nam and never had to do any jungle fighting for real, but did tons of training to do so. Our training did not include airstrikes and artillery support, so we had to focus on surviving with our own wits and whatever we could carry. Because the combat often ends up being so close, the main key to winning a firefight in the jungle is having fast reactions based on your squad formation. You'll be doing more shooting in a direction through plantlife than at actual visible enemies, so squad cohesion is key. You have to all be on the same page, so if you're in a column formation, for example, then you've got to have a plan for contact in any direction. Speed of returning overwhelming fire in any direction is what will save your life. This overwhelming fire is what's also going to allow you to peel away or to attack with flanking maneuvers or whatever, which takes even more coordination. These things all have to be worked out ahead of time and can't wait for the squad leader to give out orders while everyone sits there crapping their pants. The main other thing I took away from it is to be stealthy before you get into contact. You're MUCH better off being the first ones to open fire, so you want to detect the enemy before they detect you. 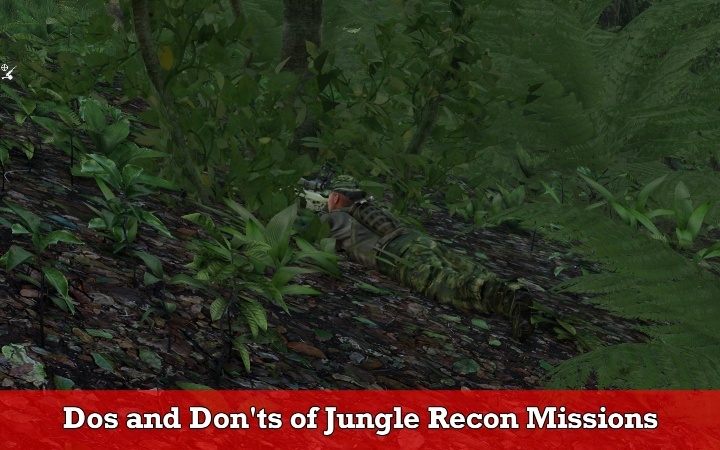 In the jungle, sound stealth is the first priority, even before visual camo. To attain sound stealth, you tape down your jingly stuff with electrical tape and jump up and down to make sure you are not jingling. Then everyone must move nice and easy, whispering or talking very quietly. Hand signals are ideal. While moving very quietly, you need to stop often and listen (and look). If you detect nothing, move a bit more and stop again. Now, depending on the mission, you'll have to adjust your tactics. If you are attacking a known position, you want to get as close as possible to the target, from 2 sides, and when the time comes, deal death with as much gusto as you possibly can. I really don't know how much sound/hearing actually matters in Arma 3, but your formation and how it reacts is still going to be key. There's obviously a lot more to it but I think stealth and quick reaction drills are the most important. One note on your video and what I've noticed playing... footsteps and the noise of moving through all the plants seems SUPER quiet compared to reality. Maybe a mod making footsteps and movement noise much louder in jungle terrain would be pretty cool. Thank you so much gents, for your comments. This section deserves a separate post.